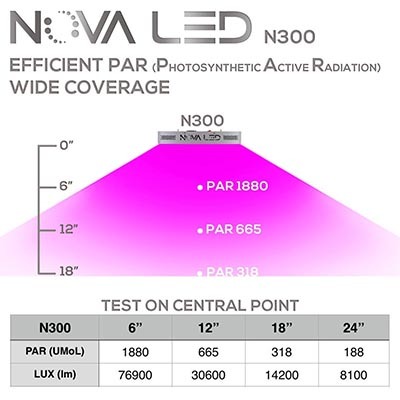 In another information article on this site we discuss lumens and how they affect plant growth, but you should be aware that a lot of scientists would argue it’s not the lumens that affect plant growth at all – it’s the PAR (photosynthetically active radiation). Understanding the difference between the two different methods of measurement may seem like nit-picking, but it’s not really. If you’ve read up on this topic you might be forgiven for thinking that they’re one and the same thing at first glance but, like any other information, it takes a while to process. There really are a lot of terms that you need to get familiar with if you’re going to start a successful grow operation of any size, but taking the extra time now to figure all this out will pay dividends for you in the future. We’re going to take a closer look at exactly what the difference is between PAR and lumens and how this might affect your grow operation. So What Is a PAR? Essentially a PAR is the amount of light that is actually available to be used during the photosynthesis process. There may be more light emitted from a particular source, but your plants don’t make use of all of it – some of it has no real effect on the photosynthesis process. It might be best to explain this with an example. For the human eye a bright white or yellow light bulb seems to illuminate the room most effectively, whereas blue or red light appears to our eyes to be very dim and so for us we prefer the brighter bulb to light up a room. The lumen is a measure of brightness or how much light is actually emitted from any particular light source at a given time. Unfortunately, plants don’t really use that bright yellow light for photosynthesis, and while your traditional light bulb may be high in lumens it won’t necessarily be very high on the PAR scale. Plants experience the best growth when exposed to both blue and red lights and this type of light, while still visible to the human eye, is better measured in terms of PAR’s than lumens. As part of the visible color spectrum blue and red light is found between 400nm and 700nm and as you approach 700nm the PAR exposure increases. As a plant grows from a seed to a mature plant its need for light shifts from the blue to the red end of the spectrum, and you can measure how much exposure to light it’s getting in nanometers by using special instrumentation – the closer the light gets to 700nm the higher will be the PAR reading. As long as you keep your plants exposure between that 400nm and 700nm range at the appropriate levels for each stage of the plant’s growth cycle, you’ll end up with healthy and productive plants. Where Does Ultraviolet and Infrared Light Fit In? If you’ve done any kind of research at all into growing plants it’s highly likely that you’ve heard that infrared and ultraviolet light is important as well, but what we’ve said in this article may seem to contradict that. We’ve asserted that plants grow because of their exposure to visible light between 400nm and 700nm on the light spectrum. Ultraviolet light and infrared light are not part of the visible spectrum, and based on our analysis so far you’d be forgiven for thinking that they really wouldn’t add much to the growth process. While some scientists may argue something different, most seem to agree that both of these types of light are also important to the growth process, but they aren’t measured in lumens or PARS. Exposure to this type of light is important for cell division and to ensure that bacteria can’t thrive and stunt the growth of the plants. If you started out with the belief that one type of LED grow light is as good as another you’ve probably changed that opinion by now. So What Should I Be Measuring? The answer to the question of what you should be measuring when it comes to your plants and their health is a complicated one. There isn’t one thing you should be looking for at all, but rather an overall understanding of everything that goes into healthy plant growth. The bottom line is you need to understand all of these types of measurement and how they affect your plant growth and, unfortunately, you’ll probably find it difficult to get all of the information you need from the manufacturer of the LEDs you’re considering for purchase. The best you can do is to make sure you do enough research and depend upon a little bit of trial and error as well. All of the information articles on this site will give you a good overview of where to start, but you should also take a close look at each of the reviews we’ve done for any products you’re considering. If you can’t find what you’re looking for here or anywhere else I would suggest contacting the manufacturer directly.